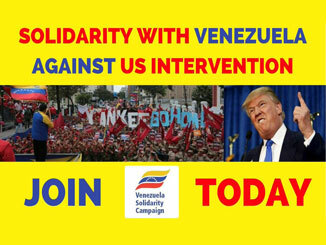 The people of Venezuela urgently need international solidarity in the face of US aggression. The Venezuelan people have a right to determine their own affairs and their democratic choice to elected Maduro as their President must be respected by the international community. ‘On 22nd January 2019 US Vice President Mike Pence speaking “on behalf of President Trump” made an impassioned appeal to Venezuelans to come out onto the streets on 23rd January to protest against the government of President Maduro – who he referred to as an “usurper” and a “dictator” – a government Pence says not to recognise, and expressing support for a “transition government”. Pence added the US will continue its efforts “until democracy is restored” in Venezuela. ‘This is an outrageous violation of international law and an unacceptable interference into the affairs of a sovereign nation plus a grotesque aggression by openly calling on Venezuelans to rise up to oust the democratically elected government of President Nicolas Madruo. ‘The US has tried to oust the democratically elected government of Venezuela since 1998 and the brief April 2002 coup against Hugo Chavez had Washington’s fingerprints all over. The US did orchestrate the ousting of Salvador Allende in 1973 also in the name of democracy and we know with what horrendous results. ‘The US extreme right, Trump, Pence, Bolton, Rubio et al are getting desperate because 20 years of golpismo, economic warfare, destabilisation, violence, financial blockade and so forth against Bolivarian Venezuela have been a failure and they are keen to lay their hands on Venezuela’s oil, gold, coltan, thorium and many other lucrative raw materials. ‘Mr Pence, Trump, Bolton, Rubio, et al must understand that who the president of Venezuela is, was decided by the people of Venezuela in May 2018 at an election which Nicolas Maduro won with 68%. It is NOT decided by the White House. Action: Stand up to Trump and Pence’s threat of ‘regime change’ in Venezuela – sign and share this petition now.